Wedding rings have become a symbol of unbreakable loyalty between wedded couples. Since wedding bands are usually worn by both the husband and the wife for the rest of their lives, it is important for you to choose the best ring that suits your devotion perfectly. The paved wedding band, a band of a simple circular shape and covered with small jewels on most of the outside, is popular because it is lightweight and does the remarkable stunt of combining simplicity with perfect elegance. Plain bands are less expensive but not as popular because of their lack of dazzling beauty. Diamonds are most commonly used in making rings because people make the connection between the stones’ durability and their own hopefully eternally loving relationship. Despite this, other precious stones such as rubies, sapphires, and emeralds are used frequently as well. The fact that there is an abundance of jewelry shops is a mixed blessing. While it is beneficial in that it means you have a wider variety to choose from for your fiancée, it also makes it somewhat difficult for you to make certain that the ring you have in mind is best out of the countless choices. This article will help you decide what ring you should choose. White gold is simply rhodium-plated gold. It is generally for people who prefer the appearance of silver-colored jewelry to yellow-colored pieces, yet still like the idea of owning gold. However, since rhodium wears away with time, the wedding band will have to be taken to a specialist to be re-dipped in rhodium periodically. If your fiancée is not the sort who would appreciate having to go to a jeweler’s for a ring she received years ago, or if her sweat is especially acidic, white gold may not be the best choice. Because white gold is a very popular metal and diamonds one of the most popular stones, these rings are extremely easy to find. One version of this type of ring is sold by Kay for $750. The ring, which consists of fifteen princess-cut diamonds, is made of 14K white gold. Kay offers another option, set at $800, also made with 14K white gold, that combines princess diamonds with round-cut ones. Another dealer, Reeds Jewelers, offers a 1/8 carats total weight, 14 karat white gold ring at $475. The width is 2 mm, and diamonds cover the entire outer portion of the ring in a single line. This band is slim but makes a strong impression. Platinum is heavy and quite exorbitant, but some believe it is worth the premium price because it is durable and naturally white—thus it does not need to be re-dipped in rhodium. Platinum is roughly twice the price of white gold, so think very carefully before purchasing any piece of jewelry made out of it. You should skip over this option if your fiancée dislikes heavy jewelry or if you are on a tight budget. Prices aside, platinum rings are simply gorgeous. Amazon.com of all dealers offers a $7100 platinum-diamond ring. The ring is 1.67 carats total weight, and is surrounded by a double layer of tiny diamonds. JR Dunn has a slightly less expensive platinum-diamond wedding band, with VS (slightly internally flawed) clarity and G (nearly colorless) diamonds. Both rings are beautiful, but they are also expensive and worth thinking twice before buying for the budget-conscious shopper. Yellow gold is very traditional so it is the perfect material for any woman who enjoys adhering to customs. 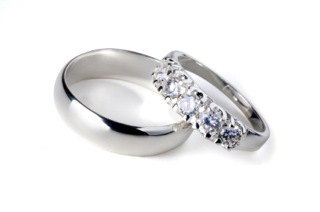 Generally, it is less expensive than white gold and far less expensive than platinum. One example of a yellow gold and diamonds band is made by Sea of Diamonds, a lesser-known company. The list price is $380, and the ring is made of tiny diamonds and a thin band of 14K yellow gold. It ranks as one of the lowest-priced diamond rings on this list. Rose gold, also known as pink gold, is not seen in engagement or wedding rings nearly as much as white gold, yellow gold or platinum are. If your fiancée is the quirky type who adores unique things, consider this option, because your wedding bands will definitely stand out. One major dealer of rose gold and diamond rings is Sears. Sears offers two fairly inexpensive options. The first is a thick, 14K band of rose gold with three layers of fair-quality I1 diamonds. The second is essentially the same ring, but cut down to just 10K and one layer of the diamonds. The former ring is $720, while its leaner counterpart sells for $324, making both rings two of the lowest-priced diamond rings on the list. Both are available on Sears’s website. Sapphires are a pretty alternative for those who want a bit of color in their jewelry, although it is not as traditional or durable as is diamond. Amazon.com lists a $1679 sapphire band made with 14K white gold. The sapphires, rather than being exposed completely, are tightly placed between two short walls of the white gold. The sapphires have been described as a mix of ocean and sky blues. The website has recently lowered the price of the ring to $839, which is of significant savings to the buyer. The reduced price makes the ring a medium-priced item on this list. An interesting twist on this choice is the wedding band made with both sapphires and diamonds. Adiamor offers these rings in yellow gold, white gold, or platinum, at prices from $700-$1020, making Adiamor rings medium-priced and higher-priced wedding bands on this listing. Both types of gold are offered in either 14K or 18K. The 14K gold bands are priced at $700, the 18K at $775, and the platinum at $1020. How do I know the ring I buy will be liked by and be perfect for my fiancée? In the past, you probably bought your loved one other pieces of jewelry such as lockets, bracelets or simply less significant rings. Think about those pieces and her reactions. Did she honestly love the sterling silver locket you gave her or did she consider it plain and unattractive? Take into consideration your fiancée’s stone preferences. Has she ever mentioned that she thinks diamonds are overrated or just plain ugly? Certain individuals prefer jewelry without diamonds due to negative associations with conflict diamonds. When you walked past a jewelry shop together, has she passed by the diamond display in favor of the emerald jewelry? Some women are allergic to certain components commonly used in rings, such as gold. Be aware of and avoid any materials your fiancée is allergic to when selecting your wedding rings. To play it safe, don’t give her a ring made of a metal she’s never worn before. While women can certainly acquire allergies to components in jewelry, it’s less risky to buy her something made of what she’s already worn than to buy her a completely new material. You should be open to the idea of having your wedding bands match the engagement ring you gave to your fiancée when you proposed. While every woman is different, most of them like the idea of wearing matching rings next to one another. As well, while you certainly don’t have to make sure your wedding band matches hers, many women find the idea of having their rings match yours romantic. Also, if you intend on the wedding ring selection to be a surprise to your fiancée, make sure you know her ring size. Imagine purchasing the dream rings—last ones in stock—that you simply know your fiancée would adore. You find the correct size for your own ring finger and choose the women’s ring that looks like it would fit your fiancée’s size. Then, when it comes to marching down the aisle and saying your vows, you find that the ring is too tight and it doesn’t fit. To avoid this disastrous scenario, check back on the engagement ring you bought her and buy the right size. If you cannot remember what size she is, simply ask her. Keep in mind, however, that this is the twenty-first century; it is much more common now for women to be involved in the selection of their own rings, including ones for engagement, than it was generations ago. If you are truly confused by the quantity, pricing and selection of wedding rings surrounding you, ask your fiancée to help you out. How will I get the best deal on the wedding bands? Once you have a general idea of what sort of ring you would like to buy, compile a list of major dealers (i.e. Finlay Enterprises, Sears, Kay, Whitehall Jewelers, etc.) that have the type of paved ring you want. To ensure you have a sufficiently wide enough selection to choose from, record a combination of both online and physical dealers on your list. Combine quality with price; if the ring has the highest-karat gold and the most flawless diamonds, it could easily set you back for several years, but if it’s too cheap, it will be clear simply by appearance that you put little care into choosing the rings. Be careful to not put price first. Women want to feel loved for and cared about, and receiving a cheap and crappy wedding ring is one of the best ways of making them feel shortchanged. So, while completely blowing your budget isn’t necessary, make certain the ring is beautiful and good quality. There is no better way of showing your future wife that she is priceless to you, that she does matter.